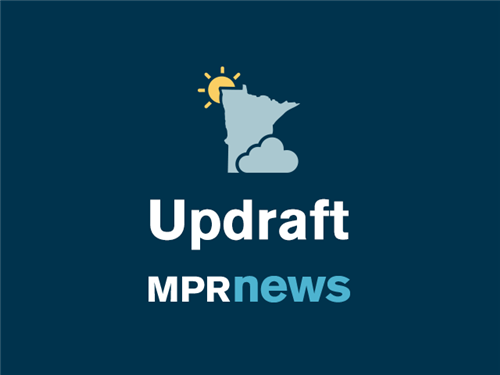 • Add #tellmpr to your cold weather social media posts - we will add the best to the blog. As cold as it's been in Minnesota, no records have fallen. The Minneapolis record that forecasters had considered the most threatened was for the coldest high temperature for this date, which was 14 degrees below zero in 1909. 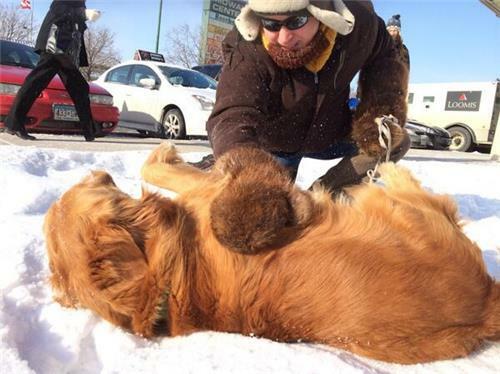 But Shawn DeVinny, a meteorologist with the National Weather Service in Chanhassen, says the temperature warmed up to 12 below zero as of 3 p.m. He says the Twin Cities didn't break the record low either. 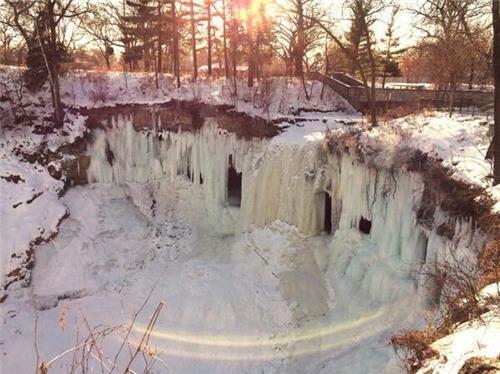 The record low for Jan. 6 in Minneapolis was 27 below in 1887 and 1912. But the mercury bottomed out around 23 below as of 6 a.m. at the airport. 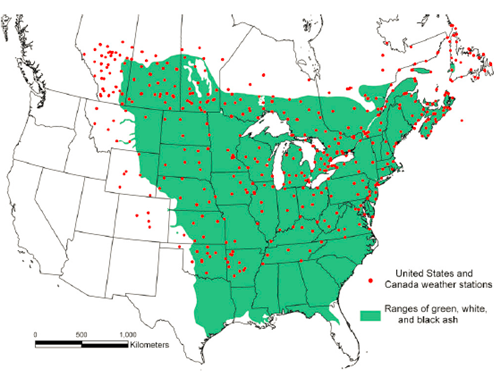 UpdraftThe extreme temperatures moving in with Sunday's arctic blast may kill off a significant percentage of emerald ash borer larvae. 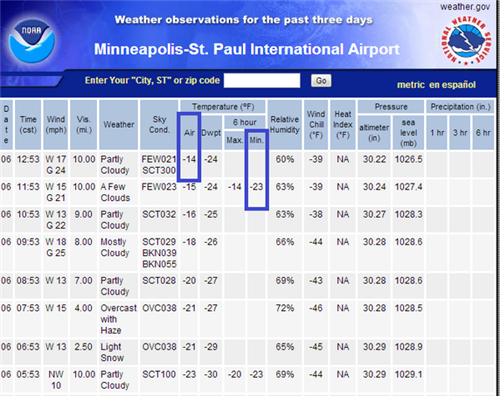 So far today, the high at MSP was -12 (3:33 P.M.) and the low was -23 (5:55 A.M.) No records broken at MSP. 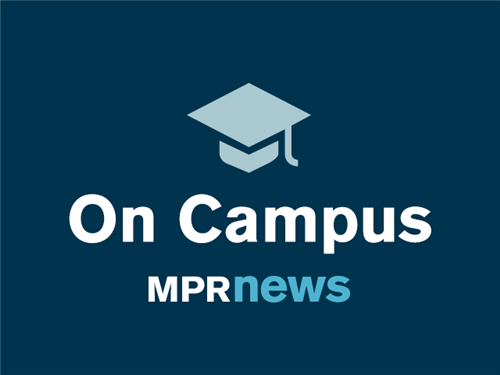 On CampusIn researching my list of Minnesota college campuses that are closed today because of the deep freeze, I noticed that Carleton College was going ahead with its first day of the session. 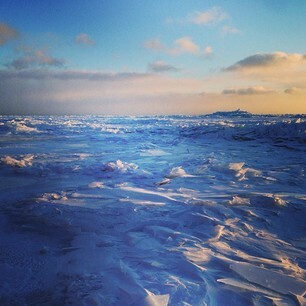 On Twitter it sent out the photo above with the remark: Yes, it’s cold. Yes, we’re holding classes. 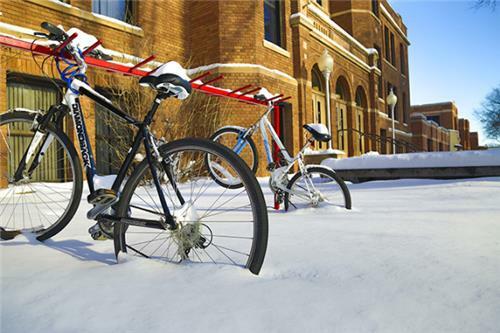 Here's a list of the Minnesota campuses that report they're closing today because of the extreme cold. 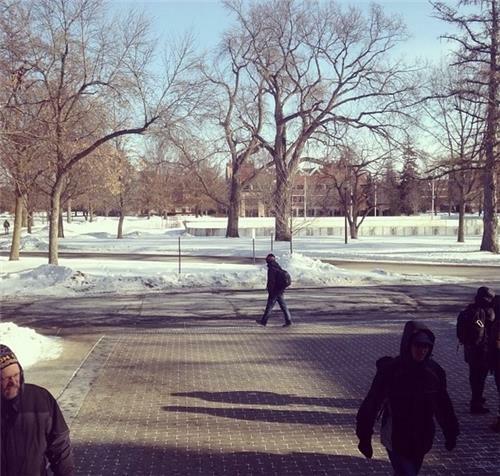 How do Minnesota college admissions representatives sell the cold? 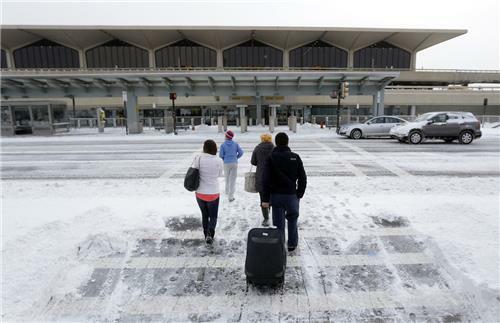 AP Airlines Writer Scott Mayerowitz has some advice on what to do if your flight has been canceled. In the past three days, more than 8,000 flights in the United States have been canceled, according to flight tracking site FlightAware.com. On Monday alone, 1 out of every 10 domestic flights never took off. * If you miss your connection, the airlines will automatically rebook you on the next available flight. However, with flights at near capacity, the next open seat could be several days away. * If you're unhappy with your rebooked flight, get in line to speak to a customer service representative. But also, pick up the phone and call the airline directly, go onto the airline's website and even consider sending a Tweet. If the phone lines are jammed, try the airline's overseas numbers. You'll pay long-distance rates, but might not have to wait. * Consider buying a one-day pass to the airline lounge. It's a nice place to relax away from the crowd and there are usually free drinks and light snacks. But the real secret to the lounges is that the airline staffs them with some of its best _ and friendliest _ ticket agents. The lines inside will be much shorter and these agents are magically able to find empty seats where nobody else can. One-day passes typically cost $50. * Use apps like HotelTonight and Priceline to find last-minute hotel discounts for that night. 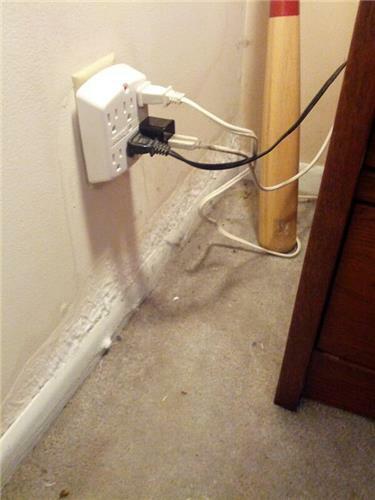 Warning: Many of the rooms are non-refundable when booked. You are not alone if your car is not working properly today. Mark Zdechlik reports AAA says it's responded to hundreds of calls for help. "We're reporting about four times the average number of road service calls," said spokesman Matt Hehl. A lot of the calls are related to dead batteries. "These cold weather temperatures require a full battery charge in order to turn those vehicles over," he said. Some drivers are having problems with deflated tires,too. "As the temperatures drops we see those tire pressures drop as well. And proper tire inflation is what's going to give you that best traction on the road." Helh's best advice: Stay home if you don't need to go out. If you have to travel, make sure you have a stocked winter survival kit. MINNEAPOLIS (AP) — It's not the heat, it's the humidity, goes the old saying. 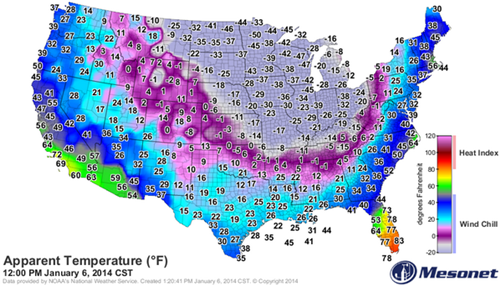 For the tens of millions of Americans currently trapped in the deep freeze: It's not the cold, it's the wind. 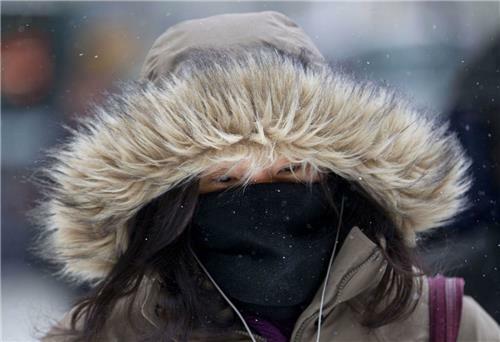 Air temperatures plunging into the negative teens, twenties and even thirties Sunday into Monday are bad enough. But add wind speeds of even a few miles per hour, and what's already deeply unpleasant becomes downright dangerous. 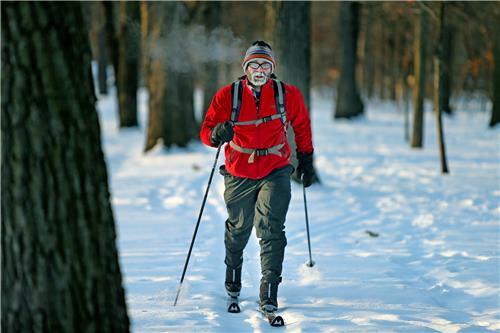 Severely low wind chills are a serious threat to the body. 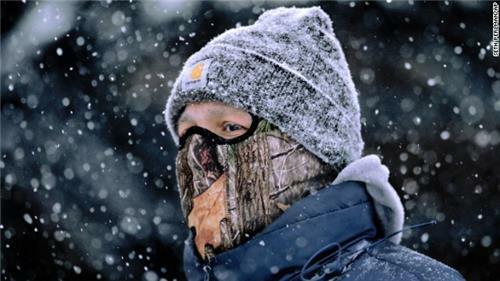 Emergency room doctor Douglas Brunette from Hennepin County Medical Center in Minneapolis says he's "seen frostbite occur through clothing." He says it's important to have clothes "made for the elements." Winds are blowing arctic air across large swaths of the U.S. — with temperatures suppressed by what meteorologists call a "polar vortex." 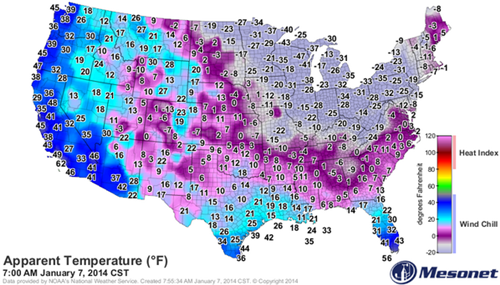 CNNThe deep freeze gripping much of the country is about to send temperatures plummeting to unbelievable lows. BloombergAirlines scrapped more than 2,500 flights across the U.S. and ran late with thousands of others as an arctic cold front and new snow in the Midwest added to disruptions from last week’s Northeast storm. 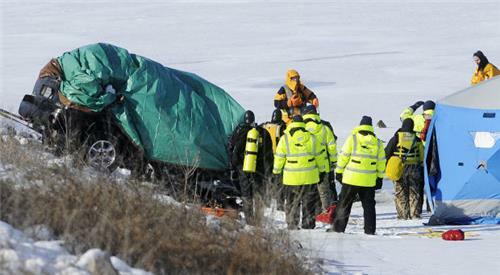 Winona Daily NewsTwo people died Sunday and two more were feared dead after an SUV crashed through a guardrail and plunged into the icy Mississippi River in downtown Winona. MPR News host Phil Picardi reports temps of -36 right now in Crane Lake. 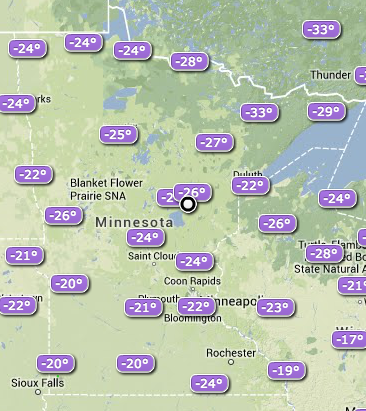 ow.ly/sifZQ Many locations in Minnesota and west central Wisconsin already -40 to -55 tonight.